Yesterday we celebrated Elena's second birthday and are preparing for a backyard gathering with friends this weekend. The forecast says the sun will return and we are finalizing the menu, which will include an abundance of summer produce. It's hard to imagine the perfect summer BBQ without corn-on-the-cob. But, truth be told, I've had my struggles with it. Corn-on-the-cob isn't particularly elegant to eat. And don't even get me started on the need for floss afterward. It's delicious, but it's also kind of a hassle. Corn-off-the-cob is more my jam. All the salty, buttery goodness without the mess. And also much easier to eat while standing around in a backyard or lounging on a picnic blanket. Corn season is just taking off and I've been seeing photos of elote popping up everywhere. The Mexican street corn is topped with cheese, cilantro, cayenne pepper, and sauce. 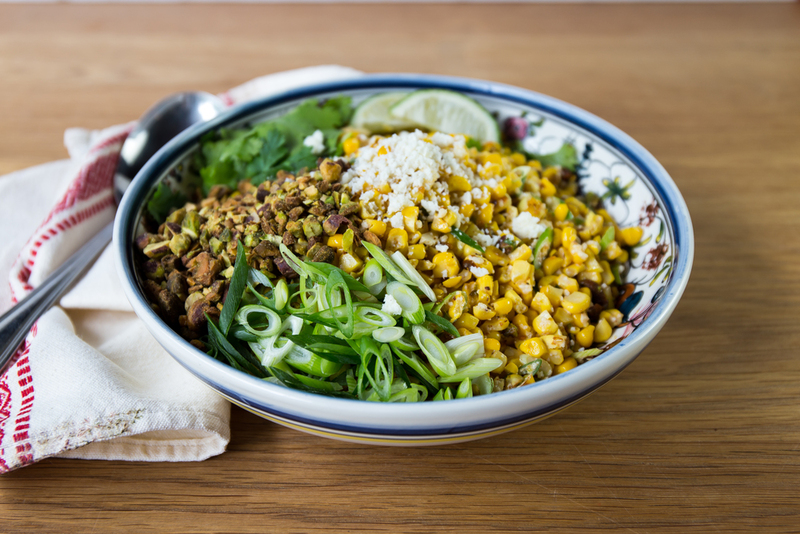 So delicious and it easily translates into esquites, a Mexican corn salad that integrates all the delicious toppings along with my favorite addition - pistachios! This salad has become a favorite and makes the best leftovers. Cut corn kernels from cobs and place and place in a frying pan. Cook for about 8-10 minutes, until just starting to char. Remove to large bowl. When corn has cooled, cut corn kernels from cobs into a large bowl. Mix in green onions, cilantro, pistachios, and cotija cheese. In a small bowl, stir together mayonnaise, chili powder, paprika, and freshly squeezed lime juice. Pour sauce over corn and stir well to combine. Top salad with additional cheese, cilantro, and pistachios. This post was created in partnership with The Wonderful Company and Williams-Sonoma Portland. Thank you for supporting the businesses who help make my work possible.